Every so often, a CEF Insider subscriber asks if I see oil-related closed-end funds (CEFs) as solid income plays. You might be wondering the same, given the surge in oil prices—and oil stocks—since the start of 2019. Today we’re going to answer that question. Along the way, we’ll uncover an energy CEF you need to steer clear of, no matter how you feel about oil. 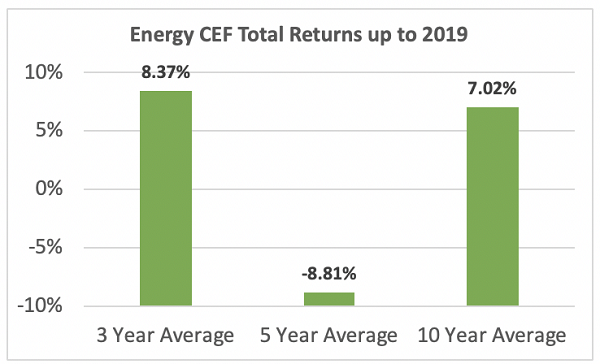 Let’s start by making a quick run through history: what would have happened if you invested in energy CEFs over the last few years? While the last three years have seen a decent average annualized return, and a negative return if you got in five years ago. Even that 7% average annualized return over 10 years isn’t great: the average US equity CEF returned 10.5% with a lot less volatility. Speaking of dividends, this fund yields an absurd 21% today. But this is a warning sign because it’s backed by the collapsing NAV we see above, which puts this dividend in serious danger of being cut. But if NDP is a bust, does that mean we need to avoid all energy CEFs now? Let’s answer that. But go a bit deeper and things don’t look so rosy. Let’s start with OPEC, which recently announced that it would need to continue its output cut till the end of the year. While that sounds bullish for oil prices, it actually isn’t, because American production has kept growing as a result of WTI oil futures being above $40 per barrel, the typical breakeven point for most US producers. This ongoing shift of oil production from the Middle East to North America will continue to limit OPEC’s ability to boost prices. There are clear resistance points between around $40.50 and $61.50, and, at $57, oil is now at the high end of that range. This tells us is that oil is high but not obscenely high, and the chances of it going down are greater than the odds of it going up. A simpler way to put it: oil funds should be pricing in the probability of a drop in oil, not a rise. 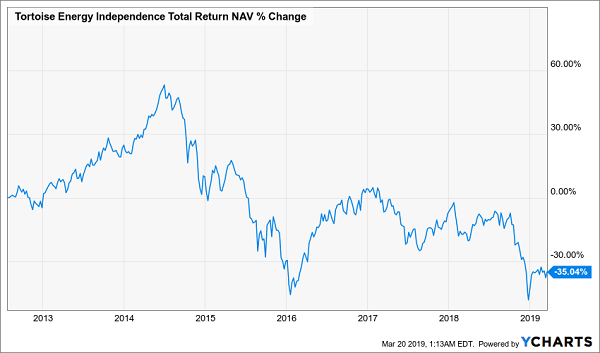 If your fund is not pricing in a drop, and irrational exuberance has driven its market price far above its NAV, it’s time to sell. Right now, 53% of energy CEFs have year-to-date price gains above their NAV gains, and 30% have price gains just 3% below their NAV gains. 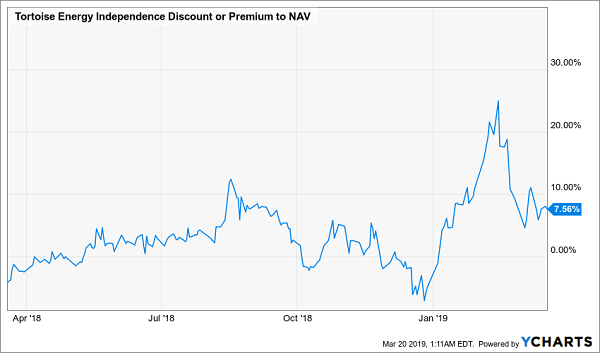 Only two funds haven’t seen this kind of overdone price rise: the Kayne Anderson MLP/Midstream Investment Company (KYN) and the Kayne Anderson Midstream Energy Fund (KMF), which have posted price gains 5% below their NAV gains. 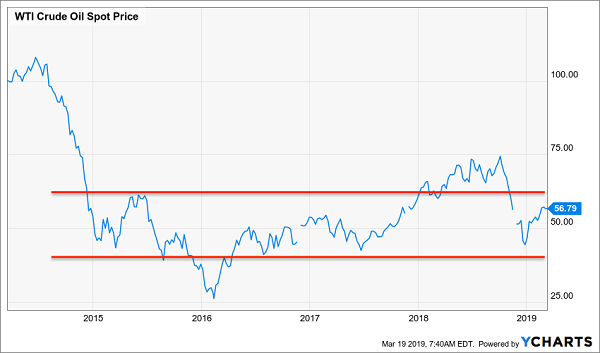 This isn’t surprising, as Kayne Anderson tends to attract savvy investors—but these funds have had some awful downturns when oil falls, so buying them now could expose you to those risks for as long as WTI sticks above $50. My advice? Turn to 15 other funds throwing off some of the juiciest—and safest—dividends on the market (including one “unicorn” yielding an outsized 9.9%!). These 15 cash machines—all buys in my CEF Insider service’s portfolio—are primed for double-digit gains in the coming 12 months! And today I’ll give you instant access to all of them. These 15 bargain CEFs trade at absurd discounts that are slowly narrowing. That puts a relentless lift under their share prices and sets us up for market-crushing gains heading straight into 2020. But the best part—by far—is the dividends. 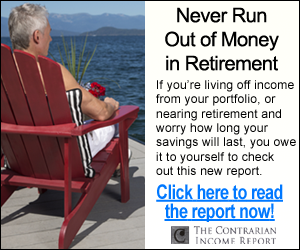 This dynamic portfolio boasts an average yield of 7.5%. And that’s just the average! 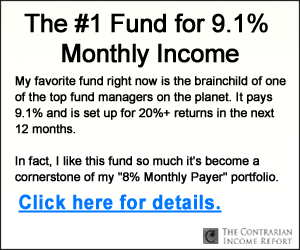 Cherry-pick my 3 highest-yielding CEF buys and you’ll pocket payouts like 9.9%, 9.8% and 8.5%! Best of all, I’ll also GIVE you my latest Special Report FREE! This exclusive guide reveals my top 4 CEF picks for the biggest dividends and strongest gains in 2019. Grab these 4 cash machines now and you’ll trigger a big income stream and position yourself for fast 20%+ upside! Click here to get the full story on my 15 CEF buys—names, tickers, buy-under prices and more—plus your Special Report revealing my top 4 CEFs for massive dividends and 20%+ price upside in the next 12 months.